Well, that crept up on us. We’re approaching the last boxes of archive material and this means that we’re having to go back to the scary box where we’ve been putting all our ‘problems’. We’ve been, more or less, ignoring this for weeks in the sure and certain hope that all the problems would miraculously solve themselves but, as is so often the way, they haven’t. Glynn, from the LAARC has joined us for a couple of hours to help with some of these (thanks Glynn *waves*). I’m not going to dwell on the problems too much, as they only make up a tiny proportion of the total number of artifacts in the archive, and Glynn’s input has given us a strategy for attacking them, so the majority shouldn’t really be problems any more (more about that next time). Suffice it to say that they consist of bags without artifacts, artifacts without bags, artifacts with bags but without labels, artifacts with bags and labels which make no sense, etc… you get the picture. 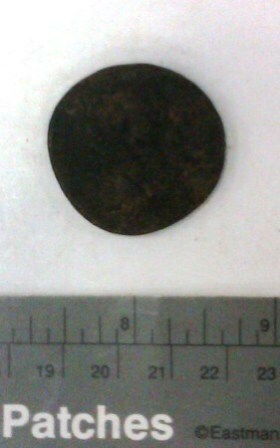 One of said artifacts, without bag, label, context or anything is this chunky coin. It’s fairly worn, but it is possible to see some of the legend. 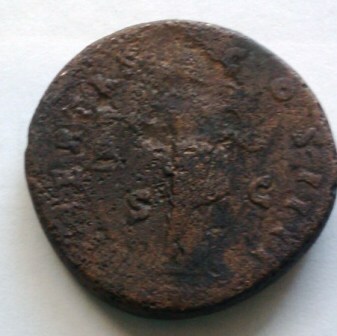 The first word is LIBERTAS, and the coin shows the figure of Liberty, and C O S IIII provides a date range, dating the coin to Pius’ fourth consulship with Marcus Aurelius II between 145 and 161 CE. SC is ‘Senatus Consulto’ – by decree of the Senate. Coming across an object like this highlights a vitally important element of an archive which I have, so far, said little about: records. It’s true, I think, to say that the objects we’ve been looking at mean little without the corresponding records, as when they are removed from all context we can barely even begin to hazard an interpretation. This coin has come to us with no record (as far as we know at the moment) and therefore no context. 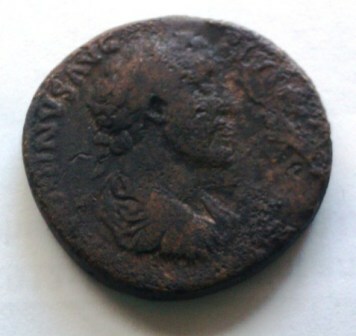 There is absolutely no mention of Roman coins in the excavation report. The dig didn’t get to Roman layers as the Roman waterfront was actually abotu 50metres north of the current waterfront. The foreshore is a tricky environment for stratigraphy in any case, but I’m sure that someone would have mentioned finding this if it had come up during the dig. So we have no clue (as yet) where this coin may have come from. A best guess would be that it was a mudlark find that’s been stored with the archive for safekeeping. There are several other artifacts which present similar problems. So this raises a question: what to do with them? This entry was posted in Archaeology, Museums and Exhibitions, Volunteering, Weapons of Mass Distraction and tagged Archaeology, London, Mass Distraction, River, River Thames, Royal Armouries, Tower of London. Bookmark the permalink. Aw, that one’s too easy. Easy for you, but I don’t do coins. There are some other interesting objects that we’ve got to figure out, but I’ll have to go through all the records to see if there are any clues. There’s also a load of loose, but tagged, pottery that were going to sort next week.